I have eaten almonds all my life. I’ve enjoyed them sliced, slivered, and whole. I’ve had them blanched, honey-roasted, and covered in chocolate. I’ve eaten them fresh from the farmer in San Rafael, California. I’ve scooped them from a heap at the spice market in Istanbul. I’ve even tried them raw wrapped in prosciutto. 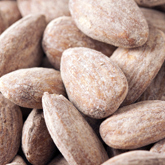 But the most memorable of them all is the roasted, salted almond from Fastachi’s, owned by Souren and Susan Etyemezian, in Watertown, Massachusetts. This entry was posted in Cambridge, Food, Local. Bookmark the permalink. Have you tried them?! If not, I must bring you a care package!! I buy 4 pounds at a time and you can’t believe how many we gobble up.